Well, we made it through 2016. But if you thought 2017 was off to a good start then think again, because according to one book, things are going to take an apocalyptic turn. David Meade, author of the book "Planet X – The 2017 Arrival", claims that "a dark star, smaller than our sun, which hosts seven orbiting bodies, some smaller than our moon and a couple of them larger than our Earth" is currently racing towards our own solar system. Meade says that one of the seven bodies currently orbiting the dark star "Nemesis" is the infamous "Nibiru," which is sometimes referred to as "Planet X." If you're all brushed up on your space conspiracy theories, you're probably, at the very least, heard about Nibiru before. Rumors of the mysterious body, whizzing through our solar system with an oblong orbit that coincidentally keeps it hidden from our view, have been floating around the internet for years. Well, whether you're familiar with Planet X or not, brace yourselves, because according to Meade, it will collide with Earth in October 2017, bringing with it the mother of all apocalyptic cataclysms. 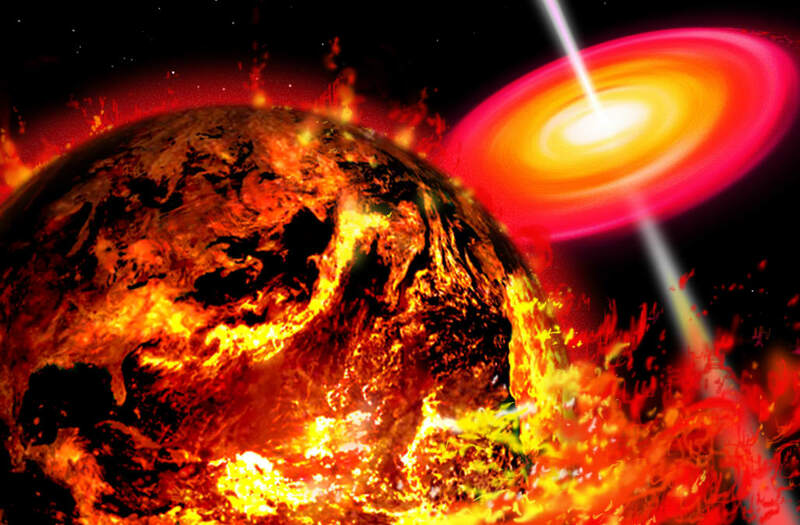 Artists' depictions of Nibiru, aka "Planet X"
Believers in the fictional planet Niburu (or Planet X) think that it will pass close to the earth, causing great devastation. Close approach of Nibiru, Planet X, over the U.S. Capitol building. The arrival of planet Nibiru, also known as Planet X, as seen from the desert. A depiction of the mythical planet known as Nibiru, or Planet X, as it hurtles toward a cataclysmic rendezvous with Earth. The arrival of planet Nibiru, also known as Planet X, as seen from a Mayan pyramid. The arrival of planet Nibiru, also known as Planet X, as seen from the Antarctic. Glitched HDR processing based on a mediterranean landscape shot, resulting in strange ghosts around the sun. A large mystery planet on the edge of our solar system. So why isn't NASA all over this supposed death star and it's seven killer planets? Well, Meade says Nemesis and Nibiru are difficult to spot because of the angle at which their system is approaching Earth. "This system is, of course, not aligned with our solar system's ecliptic, but is coming to us from an oblique angle and toward our South Pole," Meade wrote in a piece for Planet X News. "This makes observations difficult, unless you're flying at a high altitude over South America with an excellent camera." Huh -- we thought that's what telescopes were for. Anyway, if Meade's prediction has you feeling worried in any way, shape or form, just remember that we were also supposed to die in August, September and December of 2016.